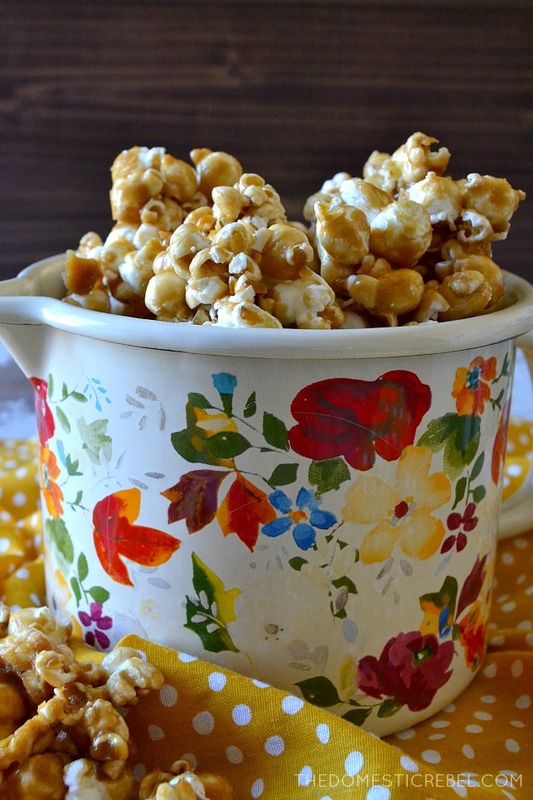 Better than the fair or those giant tubs of prepared popcorn, my Best-Ever Caramel Popcorn earns the name because it’s easy to prepare, has amazing caramel flavor, and has the perfect amount of crunch and crispiness: no soggy pieces here! So I’m not a big movie-goer usually, but I am a huge binge-watcher of TV shows which is actually kind of the same thing… but not… but kinda. Pretty much what I’m trying to say is I spent the entirety of Saturday watching the newest season of Stranger Things and I regret nothing. Okay – one thing. I regret not making this Best Ever Caramel Popcorn sooner, because it would have been perfection while I continued my one-way love affair with Jim Hopper AKA David Harbour AKA my future husband. I made myself dinner and barely touched it because this new season, man – it’s a doozy. I was on the edge of my seat the entire time, anxious AF, and could barely touch my breakfast-for-dinner eggs. So popcorn would have been much easier to munch on… and who doesn’t love a sweet and salty snack during pivotal moments in a sci-fi dramedy? Anyway, I won’t give away any spoilers about Stranger Things 2, but I will spill the beans about how you can make this fantastic popcorn at home. It’s SO much better than the stuff you buy in a tin, although I do confess, I loved that stuff as a kid. 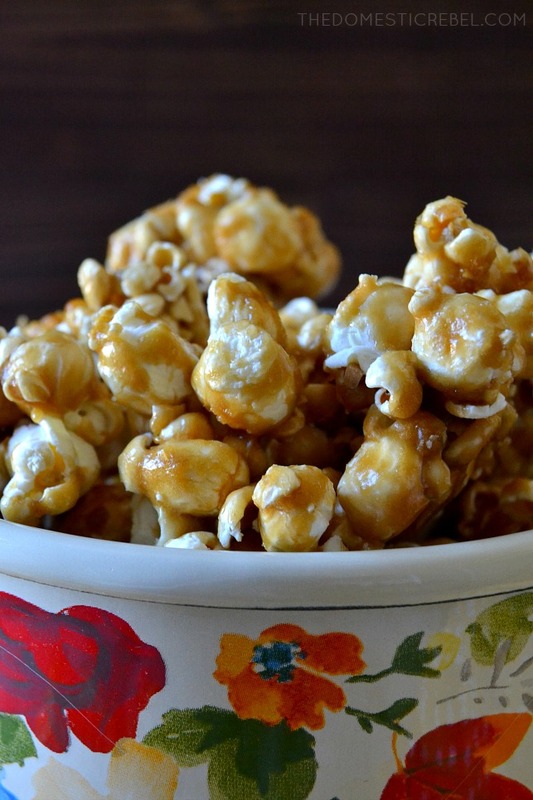 I had no idea making homemade caramel corn was SO easy, but it truly is, if not a little time-consuming. 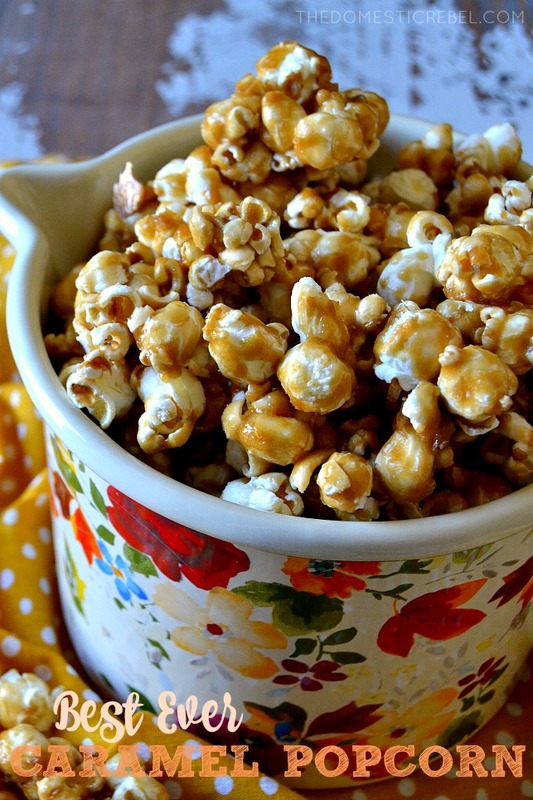 To make this addictive popcorn, simply boil together some butter, brown sugar, corn syrup, and some salt. Once it comes to a boil, stir and babysit it for awhile (about 5 minutes), then stir in your vanilla extract and baking soda. Pour that glorious bubbling gold mixture over your popped popcorn, then toss to coat and bake for an hour, stirring every 15 minutes. I love this popcorn in particular because it retains its crispiness after baking, and there’s no soggy or toothsome chewy parts. It’s just perfect! I used prepared, bagged, already-popped popcorn, specifically the “Cooking Light” Sea Salt Popcorn. Fun fact about me: I HATE making popcorn because I have bad luck with burning it, so I love this bagged stuff (found on the chip aisle). If you go this route, find a plain or simply salted popcorn; this is not the time to use movie theater-style butter popcorn. You can obviously make your own popcorn with actual kernels if you feel like channeling Orville Redenbacher himself, but I do not look good with a beard, so I used bagged popcorn. I HIGHLY recommend using disposable foil roasting pans for this. I had only one roasting pan and then used two rimmed baking sheets and the baking sheets were a pain in the rear because when I went to stir the popcorn, it flung everywhere and jumped overboard, whereas the roasting pan has higher walls to better contain the popcorn. So as you can see, while slightly labor-intensive, this popcorn has a delicious payoff, and it keeps well in an airtight container! So whether you’re smuggling it into the theater to see the latest flick or just sitting on the couch catching up with my true love, Jim Hopper & the Gang, you won’t regret making this highly addictive popcorn! 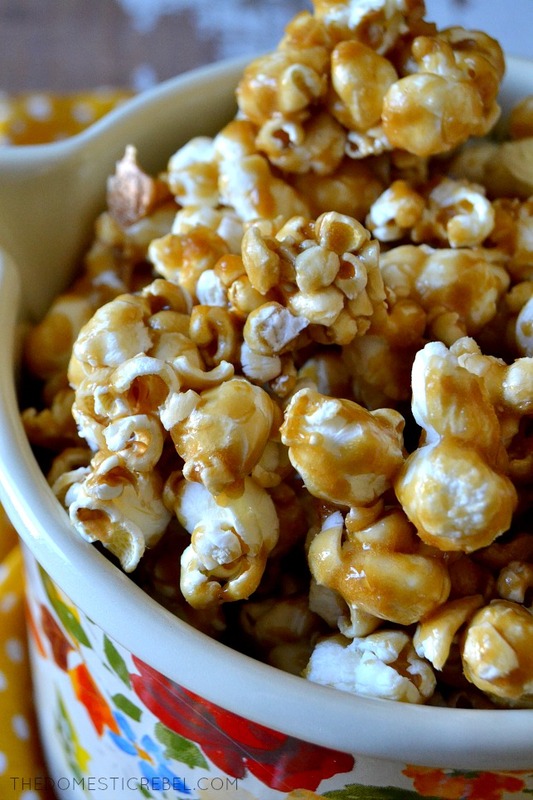 This Homemade Caramel Popcorn is the BEST EVER! Crispy, sweet, salty, and utterly addictive! Preheat your oven to 200 degrees F. Lightly grease two deep turkey-roasting pans (such as disposable foil pans) with cooking spray. Add in the popcorn in an even layer. In a heavy bottomed medium saucepan, melt together the butter, light brown sugar, corn syrup, and salt. Bring to a boil on medium heat and stir constantly for 5 minutes. Remove from the heat and whisk in the vanilla extract and baking soda carefully as the mixture will bubble up significantly and violently once the baking soda is added. 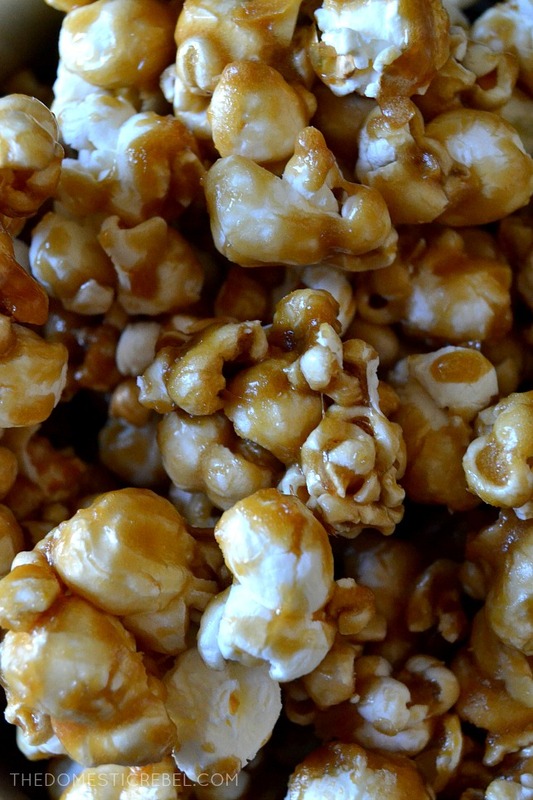 Pour the caramel evenly over the pans of popcorn. It's OKAY if the caramel doesn't coat each piece as the oven will help melt the caramel some more to coat everything during the baking process. Bake for 1 hour, stirring every 15 minutes so popcorn becomes thoroughly coated. Once the hour is up, cool the popcorn completely before serving and breaking into bite-size pieces. Addictive, crispy, crunchy, sweet & salty goodness! You’ll love this popcorn! ahhhh I love caramel corn! !